Just What is Bottled Water? 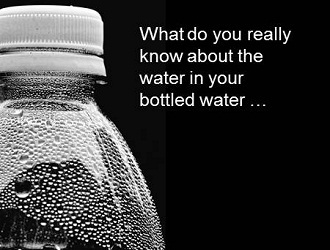 Do we really know what’s inside our bottled water? China Water Risk’s Debra Tan takes a closer look., Do we really know what’s inside our bottled water? China Water Risk’s Debra Tan takes a closer look., Do we really know what’s inside our bottled water? China Water Risk’s Debra Tan takes a closer look. There appears to be lots of choices in bottled water, but in fact there are few. ‘Glacier Bottled Water’ is NOT ‘glacier water’ and ‘spring water’ is NOT the same as ‘mineral water’. There is uranium and arsenic in bottled water, which unlike tap water is not regulated as water. Let me see … could it be because the general perception is that no water in China, no matter which mountain spring it came from is clean? Surely this cannot be true because the Himalayas (on par with the Alps) should produce some fabulously crystal clear waters. And what of the waters from the amazingly blue glacial lakes I have seen many a kung-fu master leap over? Surely, with some marketing spin, I would be sipping pearls of wisdom from an ancient source deep in the heart of Shangri-la. And yet I am not. Somehow, ‘all water in China is polluted and undrinkable’ pervades. I generally try not to drink bottled water because of the obvious reasons of plastic waste. OK, I know plastic can be recycled but recycling needs more energy and water; water that we, here in Hong Kong/ China may apparently run out of in twenty years. The Ministry of Water Resources in Beijing projects that demand will exceed supply by 2030 if we carry on with business as usual. I could opt for the glass bottles but with no glass recycling facility in Hong Kong, the already stretched landfills would bear the brunt of my bottled water drinking. Although I am encouraged to hear that the Hong Kong government has just announced on 15 Jan 2011, a pilot programme involving a glass recycling scheme in six housing estates. So tap water, which didn’t undergo the bottling process nor incur lots of carbon miles being flown from some remote spring appears to be the best choice. Besides, Hong Kong tap water meets the WHO standards for drinking water. Yet many choose to drink bottled water because1 it tastes better than tap water2 they believe it is direct from source and has not been treated like tap water and3 convenience – it is easier to find a 7-11 than a water fountain in Hong Kong. Upon reflection, I realized I am primarily making my choice of bottled water based on brand advertising. In fact, staring at the vast selection on the shelf, I realized that I didn’t really know anything about bottled water. It was time I found out more about the choices available and just exactly what was in the bottle. Perrier or San Pellegrino, Vittel, Acqua Panna or something quirkier like S.Bernardo? I thought they were 4 independent brands with Pellegrino & Acqua Panna belonging to the same family. I was wrong. They are all owned by Nestlé, as are Poland Spring, Arrowhead, Deer Park, Ice Mountain. Unlike Nestlé KitKat, Nestlé Nesquick, Nestlé Nescafe, Nestlé Milo, none of these bottled water labels indicate Nestlé as their common owner with the exception of Nestlé Pure Life (distilled water). A closer inspection of the labels of other major bottled water brands revealed the same. No wonder I assumed they were all independent and in competition with each other. A bit of internet surfing showed me that my personal universe of water choices of 10 brands shrank to 3 owners – Nestlé, Danone & Coca Cola. Not surprisingly, Nestlé Water is the world’s #1 bottled water company with an estimated global market share of 18% with Danone coming in second at an estimated 8.5% with roughly 18 billion litres of packaged water marketed in 2009. Nestlé Pure Life, the biggest water brand in the world achieved a 14% organic growth in 2009 alone. Nestlé Water alone had sales of CHF9bn (USD9bn). In the US alone, 32billion litres1 of bottled water were consumed in 2009 compared to UK’s consumption at 1.7billion litres2. Words such as ‘Artic’, ‘Glacier’, ‘Spring’ and ‘Pure’ feature a lot on bottled waters, as do snow-capped mountains, So back to the springs – Do these springs never run dry? Tens of thousands of bottles of Evian are sold every year all over the world – surely the Evian spring is stressed? Nevermind the carbon footprint incurred in flying/shipping those bottles all over the world from France. The top four global water brands are all from French springs – Vittel, Evian, Volvic and Perrier. Natural Mineral Water must come from an identified and protected source. It is guaranteed to be consistent in composition and naturally wholesome without any treatment – except in some cases the addition of carbon dioxide to make the water sparkle. Natural Mineral Water status is only granted to waters that are demonstrated to be free from pollution and have a characteristic stable composition.Spring Water. In the UK, like Natural Mineral Water, Spring Water must originate from an underground source, be bottled at source and be microbiologically safe without treatment. However, in the UK, unlike Natural Mineral Waters, certain other treatments are permitted for Spring Waters. Treatments may include the removal of certain minerals as defined by the European Union Scientific Committee for Food, which has yet to issue its guidelines. These allow the removal of undesirable substances. So spring water can be / is treated, just like our tap water. For US brands, you can read all about this in “Bottled & Sold: The Story Behind our obsession with bottled water” by Peter H Gleick, a renowned scientist and freshwater expert described by the BBC as an environmental visionary. Gleick, also states that given the current FDA Standards of Identity in the USA, there are almost no requirements for truth in branding. For example, a tap water filled bottle can be called “Glacier Bottled Water” but not “glacier water”; hence the proliferation of glacier/artic/bottle/spring combinations. The sneaking suspicion of ‘I-am-getting-ripped-off’ looms. The label on the bottled water gives me nutrition facts for water such as water has no fat, carbs or calories. Talk about stating the obvious. What about the mineral composition that makes the water taste unique? Here in Hong Kong, you would find this missing from the label but may occasionally stumble across a bottle meant for Europe or Australia and find a label with the mineral breakdown. But then again, the mineral breakdown requirement is misleading as not all mineral categories are required to be disclosed. A case discussed by Gleick in his book, Fiji Water v. Cleveland municipal water springs to mind (pun intended). In 2006, Fiji Water ran an ad with the tagline “Fiji because it’s not bottled in Cleveland” which brought about a challenge from Cleveland municipality to test its tap water against Fiji water.The lab tests reportedly indicated that Fiji Water contained volatile plastic compounds, 40x more bacteria than are found in well-run municipal water systems and >6 mg/litre of arsenic whilst Cleveland tap water had no measurable arsenic. Fiji countered with their own tests showing <2mg/l. Fiji Water is currently being sued in the US in a class action lawsuit complaining that Fiji’s statements about producing carbon-negative bottled water since 2008 are false (more on this) . So if pure, crisp Fiji water has tiny amounts of arsenic, what else do other mineral waters have? Uranium. 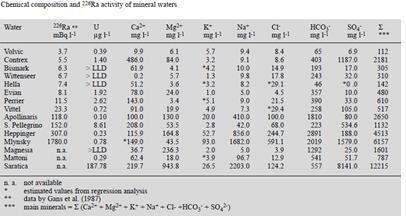 17 bottled mineral waters preferably consumed in the test area : the median of was 0.44, the maximum value was as high as 10.6microgram/l. 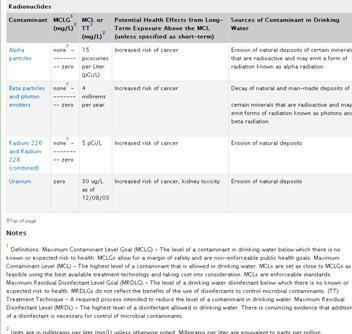 The US Environmental Protection Agency (EPA) has set the Maximum Contaminant Level Goal (MCLG) for drinking water for uranium at zero as there is no safe dose for radioactivity, but allows a Maximum Contaminant Level of up to 30microgram/l, with the potential health risk being increased risk of cancer and kidney toxicity. Well, I have certainly changed the way I choose my sparkling mineral water. Why do ‘safe’ minerals like calcium, potassium, magnesium, bicarbonates, chlorides, silica residue, nitrates, and sodium sulphates make it onto the label (in Europe and Australia) whereas ‘unsafe’ minerals like uranium and arsenic are omitted? Should we not know what we are putting in our bodies at the point of sale? Do we not have the right to know? Now that I do know, I’m sticking to good ole tap water. At least I can call the HK water supplies department to do a test of the water going into the building and coming out of my tap AND if I am still worried, add a filter or go the old fashion way and simply boil water. It is environmentally friendly – no plastic or glass waste. Unfortunately, there may not be such a choice in certain restaurants and bars in HK, a pet peeve to be discussed at another time.